Marc Jacobs Summer Collection is something we look forward to year upon year, and yet again they have not been a disappointment. They look amazing and smell fabulous! This year they have named the collection ‘Kiss’ whilst using a hot cerise pink shade in an ombré/gradient style on both the bottle and packaging of all 3 fragrances. These scents scream Spring/Summer and this is one reason it gets us super excited when they arrive into store, not only are we excited to smell them but we know that some warmer weather isn’t too far away (hopefully that isn’t wishful thinking). As always, these fragrances are Limited-Editions, and are completely different compositions to any of the past collections. This collection captures femininity, fun and free-spirit, they are uplifting happy scents that are easy to spritz on during the hotter months or would make fabulous holiday fragrances. 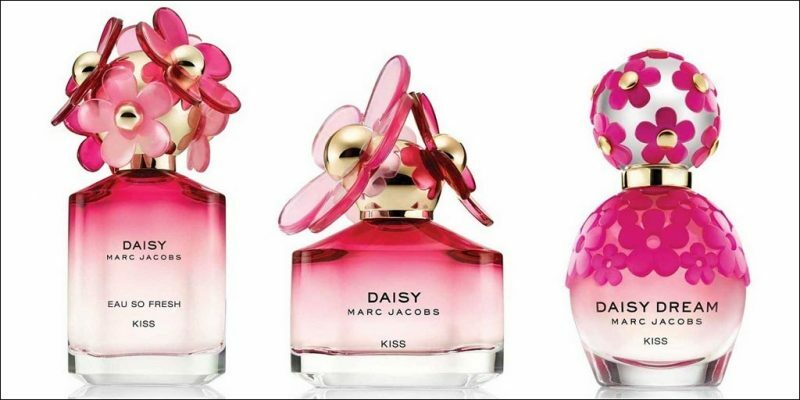 Daisy Dream Kiss is my personal favourite in this collection as Rhubarb & Pineapple seem to be notes within fragrance that I’m really loving at the moment. However, the Jasmine & Musk soften the sweetness slightly.